EnergyView™ is the management application for the EnergyFusion™ system. It incorporates a range of powerful features; it has been designed with an intuitive graphical interface that simplifies management. This management software allows the building facilities to be configured and managed giving access to the intrinsic power of the EnergyFusion™ system and reduces the management burden. It allows unprecedented levels of control and easy configuration whilst hiding unnecessary complexity. 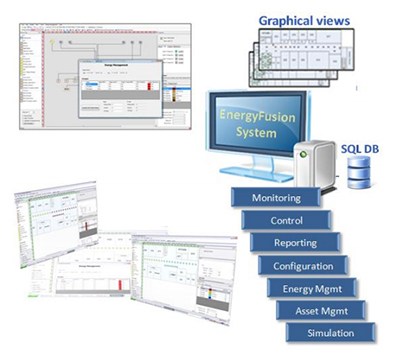 EnergyView™ software allows all elements of the system to be represented graphically. 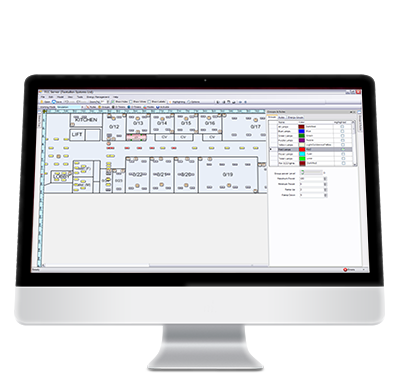 Controls, Sensors and EnergyFusion™ Hubs for management of the building facilities, (such as Lighting), are represented by graphical icons to be viewed against the backdrop of the architectural floor plans. The screen is kept ‘informed’ by events sent from the hubs in real-time. Each icon provides an active representation of the real device being deployed. If the status of the device changes, the icon on the screen reflects this on a dynamic basis. This is a very powerful approach which lends itself to the management of the system but the power of the software only begins there. The model once completed is automatically loaded into the hubs and provides dynamic feedback of the active status of every active system element in real-time.